It unites. It creates a cultural footprint. It is delicious, rich, and comforting: food. Beyond those qualities, food is a powerful resource. Unfortunately, the reality is that it is not equally accessible throughout the world, despite efforts to prevent world hunger. There were 925 million hungry people worldwide in 2010. This is an unthinkably high number given that around 7 billion of us live on earth. I recently explored an American Museum of Natural History exhibition “Our Global Kitchen: Food, Nature, Culture.” Beyond the many interesting facts and beautiful presentation of the exhibition, what stood out to me is how culture shapes our outlook on food, how food ties into memory, and how it creates an interconnectedness between people. 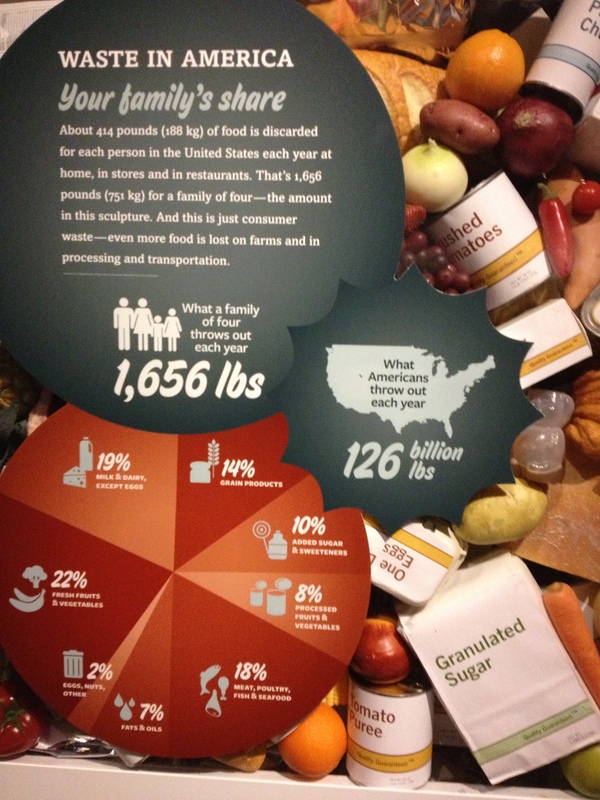 This “Waste in America” statistic reveals that a family of four throws out 1,656 pounds per year. Think about how much food you buy at the grocery store – milk, bread, eggs, vegetables, fruit, pasta, etc. If you’re not one to cook, take into account expenses for eating dinner out or ordering take-out. The numbers add up quickly. Now, consider how much you might be overbuying with those impulse purchases or seemingly great deals. At the end of the month, if you’re not careful, you might be growing “vegetation” you hadn’t planned for. Do you often discover food in the back of your fridge or in the pantry that you’d forgotten about? What are your thoughts on the food waste statistics? 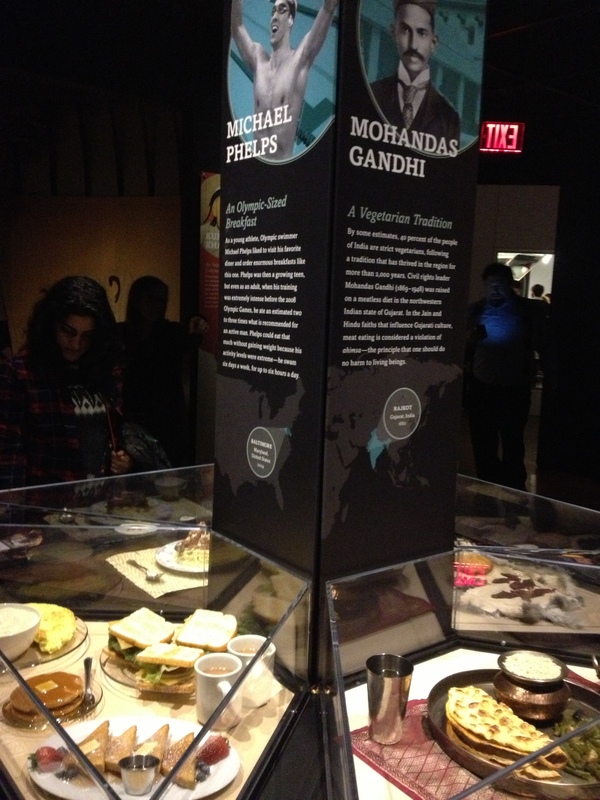 The “Michael Phelps vs. Mohandas Gandhi” diet comparison isn’t entirely fair, but the focus isn’t on portion control. If you look carefully, you’ll see a visible difference highlighted in the food groups. This is where culture most visibly comes into play. Pancakes, multi-layered sandwiches and an omelet for Phelps are true staples in the American diet. Naan and hummus for Gandhi are reflective of Middle Eastern and Asian influences. Through my family’s celebration of food, cooking “lessons” with my mom and grandmothers, and travel, I’ve come to believe that food tells a story of a culture or even a person. Specific smells can trigger childhood memories. Your favorite dish might remind you of family, an event, or could conjure up different emotions. Find out about my appreciation for good cuisine in this older post, too! How important is food to your life? How do you manage your intake? What steps can we take to cut food waste? What associations do you have about culture with food types? Ever tried a dish you never imagined you would (while traveling)?